Reminder: TrueScrap 6 Individual classes discount price of $9.99 US per class ends tonight! Find out more here. I had a really nice Thanksgiving week. Now for me that is quite remarkable because I admit I'm a Thanksgiving Scrooge. The other reason I'm a Scrooge at Thanksgiving is that something always goes wrong in November. And plenty did this year but the week of Thanksgiving ran smoothly and I enjoyed myself a lot. My parents joined us for lunch and seemed to really like the meal. I got all my Christmas decorations up by Wednesday afternoon. I even vacuumed and put the boxes back upstairs! We helped my parents rake leaves getting that task completed before the holiday also. I had my first experience using a blower. If my aunt was watching us out her kitchen window, I'm sure she had a chuckle or two at my efforts although I did get the hang of it. I do love decorating for Christmas, I like the baking, cardmaking and sharing, and just the general feel of Christmas. My mother starting me on decorating my garlands. It was her idea to put a garland up the stairway years ago and she bought a lot of my ornaments at after Christmas sales. She is not a shy shopper and has been known to climb up on displays to get the ornaments she wants. I've added to the collection and still love my garlands. I finally gave in and went to a small artificial tree rather than a large real one. Electric leaf blowers and mowers that pick up leaves. I remember as a teenager having to rake and haul and we did the work in a quarter of the time with the right equipment. The 50 year old trees at my parents house produce a lot of leaves! My husband who is the most easy going person in the world taking everything in stride. With just a hectic month, I haven't always noted my gratitudes but I do find myself counting my blessings more even if I don't write them down. So for that I'm also grateful to November. Congrats on the Etsy sale!!! I hardly ever cook anything I don't like to eat, lol. So when I do cook chilli, I remind my husband how much I must love him, teehee. 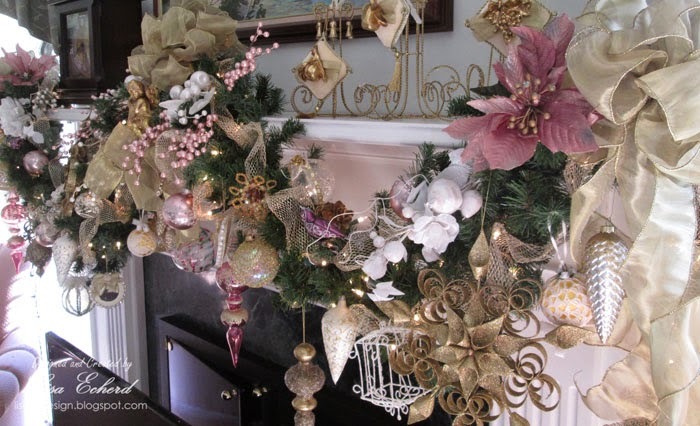 Your garland with the ornaments is lovely.